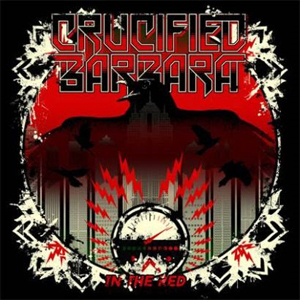 Scandinavia's leading all-lady hard rock/heavy metal outfit, CRUCIFIED BARBARA, has launched a video for the new track "I Sell My Kids For Rock'N'Roll", which is from the band's most recently released fourth album, In The Red, out now on Despotz Records. The band's Despotz debut was recorded at Studio Music-A-Matic in Gothenburg, Sweden with producer Chips Kiesby and engineer Henryk Lip. Artwork for album number four comes courtesy of Stockholm, Sweden artist Erik Rovanpera. Dealing with topics like misogyny and animal rights, CRUCIFIED BARBARA calls In The Red, "the best thing we've ever done musically. We have always been shocked by injustice and oppression, and this time, our opinions have taken an even bigger place in the songwriting."